I've a new critter in the garden~This is the first Clay and Limestone sighting for this super duper cool Halloween colored soldier beetle. Am I ever glad I checked this critter out before dispatching it to bug Hades. Pennsylvania Leatherwings are highly desirable biological control agents. Simply stated~they are good bugs that eat bad bugs! A highly beneficial rascal to have around the garden. Don't you think it resembles a Lightening Bug (LB)? I did, and that helped me discover its identity. Describing what it looked like and on which flowers it was feeding took me almost immediately to Pennsylvania Leatherwings. What a cool critter. It's no accident that the PLB resembles its close relative the firefly/Lightening Bug. Clever Mother Nature helps critters mimic poisonous look-a-likes and survive predators. No smart bird or wasp wants to eat anything that resembles a firefly with their poisonous blood that oozes from the base of their wing covers. On the other hand~our orange hero is a tasty treat for birds, bats, spiders, ground beetles, and other small predators. Prof Michael Raupp wrote that, "Like other members of this clan, soldier beetles are natural born killers in both adult and juvenile stages and are highly beneficial rascals to have around the garden." (source) The adult Pennsylvania Leatherwings are especially important predators of aphids and their larva consumes grasshopper eggs, aphids, small beetles, caterpillars and other soft bodied insects, most of which are pests. Go here and here for more on their life cycle. I sure hope they lay eggs in the soil in my garden~I've had a plague of grasshoppers this year, so there will be lots of their eggs for them to nosh on! The Pennsylvania Leatherwing may be a pest consuming machine but, they play an important role in pollinating native plants like Helenium autumnale/Sneezeweed, Verbesina virginica/Frostweed and other native plants in natural areas and our gardens. 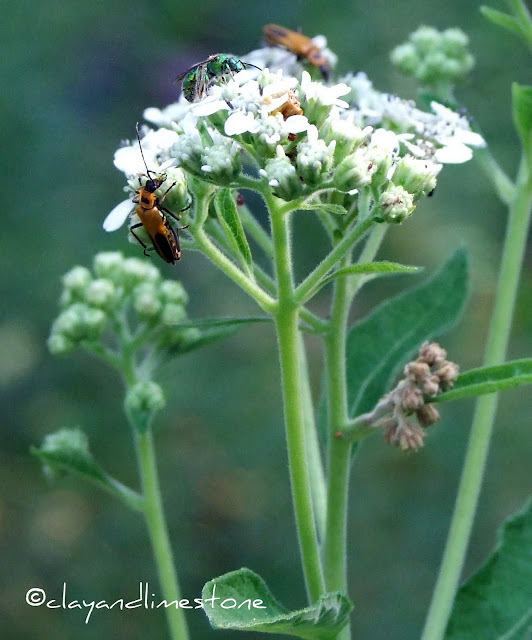 I am tickled pink to find these beneficial insects living in the garden and dining on the natives that were added to the menu with this in mind. 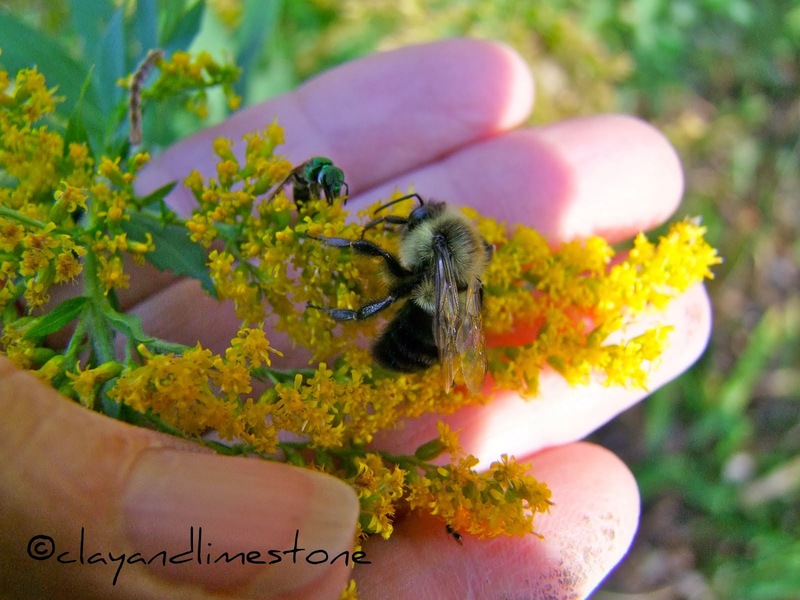 Later this month when the Goldenrod Blooms they may stop by to nosh on its golden pollen. When that happens I'll call them by their other common name: Goldenrod Soldier Beetle. What's noshing in your garden? He/she makes me hungry this morning. Mornin' glory! Thanks for the info, dear Gail! We have scores of this bug and I figured it was a weird lightning bug. Good to know it is on our side. I have had these guys in the garden before. I will have to get out to see if any are noshing around here now. Have a great week. I found a few at the farm and took the photos because I had no clue what it was. Thanks for the ID. Now I know why I saw them at the farm, it is grasshopper heaven there. I also thought lighting bug like too when I saw the first one. I will keep an eye out for them on my Helenium autumnale. Colorful little critters aren't they? And 'blood that oozes from the base of their wing covers' sounds quite like a line from a Dracula type movie. Soldier beetles are seen in my garden each summer. 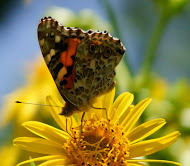 As you so rightly say, they are a wonderful insect to have around and add to balance to a garden. I love the images that you show....beautiful. Oh good, I have these guys all over my garden! I always wondered if they were good or bad. They never seemed to do any damage, so I left them alone. Good thing I did! i, too, always enjoy your insect info. it's made me pay a lot more attention to the bugs in my garden. what's noshing out there now is a caterpillar. it's on my spicebush and is the wildest looking thing i've ever seen! like a scotty dog with a green sweater on. i was hoping for a spicebush swallowtail, but as it turns out it's a mean, stinging saddleback moth caterpillar. kind of a disappointment, that! I have seen these around the garden...yippee! They must have eating lots of aphids I have found on my roses. His coloration looks really good on that sneezeweed. Thanks for the ID, I would have assumed it was a lightening bug. Gail, you are a wealth of information and timely at that! I have had swarms of these beetles in the past, and although I knew they were called soldier beetles after someone i.d. 'ed them, I never bothered to check them out for more information. I'm glad to know they're such welcome guests, especially if they eat grasshopper larvae. My goldenrod is already blooming, so I'm going to have to see if the soldier beetles are back on duty! Good to know! I've seen a lot of them this year. Although they aren't doing thing for my aslecpias which is covered in aphids right now. That is one honking big bug!!! Glad actually that we don't have them out here, yet...with global warming and all. good job identifying this bug. I often have trouble identifying all the insects in my garden so everybody gets a lease on life lest I inadvertantly kill the wrong bug. I have heard of soldier beetles but had no idea what they look like. I also did not know that fireflies are poisonous, though I would never be tempted to eat one! Now that I am a bit more educated, I hope to find some of the good guys in my garden. Not that fellow, but I wish he were. What a soldier--I need him because some critter is eating holes in the whole garden. Blast. Thanks for the info--very enlightening. Wow, what wonderful critters! I'll keep an eye out for them. I've never had soldier beetles in the garden though in the summer I see the red ones on the hogweed which thankfully isn't in my garden. I didn't realise how garden friendly they were. Our red ones seem to spend their summer days mating. Never have I seen one of these bugs before but he is hands down the coolest looking guy around. And if he will control the grasshoppers he's welcome in my gardens any day. Great pics! I love bug pictures - these are great! Glad it's a beneficial. I found a little beetle with one red spot on its back. Don't know what it is though! A very informative post Gail. I love soldier beetles, and we had scores of them this spring, around the time of the first flush of aphids, but I'm wondering if our species here actually eat grasshopper eggs. We seem to have lots of grasshoppers this year, too many! Your chap though is most handsome, much more colorful than ours. It's working now. Very cool bug! I must be on the lookout for it. I hope it eats grasshoppers as there are lots of them here this year. Our soldier beetles appear in July. They are a bit smaller, orange in colour and are always seen in pairs. Lovely images. I wondered what that strange bug was that I saw. I thought it a lightening bug. How you keep your keen eye on 'the world' ... both 'big and small' is amazing, dear friend.